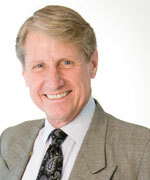 Russell Wasendorf Sr. is the CEO of Peregrine Financial Group, a major futures trading company. He recently confessed in a suicide note that he embezzled millions from clients for nearly 20 years. His suicide attempt was prevented by Cedar Falls police, who noticed his car had a hose running from its tailpipe to the interior. While in the hospital, Wasendorf was arrested and charged with lying to regulators. He will likely face additional charges with the potential of a long prison sentence. "I was forced into a difficult decision: Should I go out of business or cheat?" "I guess my ego was too big to admit failure. So I cheated." "With careful concealment and blunt authority I was able to hide my fraud from others." "If anyone questioned my authority I would simply point out that I was the sole shareholder." We can all relate to the temptation to cheat when the chips are down. But few of us can relate to the pressure of thousands of people looking to you for help. Additionally, few of us work in an industry that worships greed. When combined, no wonder so many crimes are committed by executives in the financial services industry! We miss the lesson of this crime if we only blame Wasendorf. Yes, he failed to follow regulations, and should have been arrested and forced out of business decades ago. But what is really going on? What is the bigger picture? The overall problem is greed, especially in the financial services sector. We must ask ourselves: what value is being added by the financial services industry? Occasionally they help new companies raise money. They give us a safe place to store our money, and they make it easier to buy and sell things. But what value is provided by short-selling, futures, options, derivatives, or program trading? While most financial transactions are complicated, they can all be subjected to a simple value-to-society test: Will the world be a better place afterwards? With most financial transactions, someone benefits from another person's misery. So, most financial transactions do not pass the value-to-society test. In an industry driven by greed, the issue of value added to society never rises to the surface. Instead, it is ignored in the quest to make a buck at someone else's expense. This is why we need to redesign the entire financial services industry. We need to eliminate all transactions that basically rely on someone winning at someone else's expense. The other problem underlying the Wasendorf case is accountability: most CEOs are not held sufficiently accountable to society. So, they let greed guide their decisions, and everyone else suffers. This is an easy explanation for how CEO compensation has continued to climb into the stratosphere while everyone else's pay declines. This is why we need to redesign corporate law so that CEOs are once again held accountable to society. For details on how to reform the financial services industry and make CEOs more accountable to society, read Deep Economics, Part 5. Egypt's revolution of 2011 seemed like a success. Mubarak resigned, parliament was disbanded, the constitution was suspended, and free elections were scheduled. All of this was accomplished while the military exercised considerable constraint, thus avoiding widespread killing. The whole world seemed to breathe a deep sigh of relief. But Egypt's revolution had a critical flaw: It only addressed three branches of government: executive, legislative, and military. The judicial branch was ignored, and now Egypt's revolution is paying a severe price. Over the past year much has surfaced about Egypt's armed forces. They are quite independent from the executive branch, and its top officers are among the nation's wealthiest individuals. The military operates massive civilian businesses, including roads and housing construction, consumer goods manufacturing and distribution, resorts, and vast tracts of real estate. Most of the military's financial statements, along with its officers' incomes, are tightly held secrets. 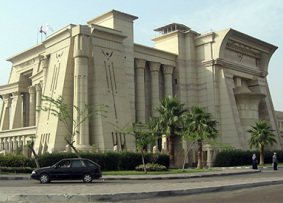 Some experts say it controls as much as forty percent of Egypt's economy. Indeed, Mubarak began accumulating his vast wealth, estimated in the tens of billions, as an officer in the air force. Without a doubt, the military is a central force in Egypt. The world is just now realizing, however, that Egypt's judicial branch, headed by its Supreme Constitutional Court (SCC), is a critical fourth branch. It has played an essential role in supporting Egypt's wealthy few all along the way. The SCC is an independent and autonomous branch of government. Its decisions are final and become the law of the land. The SCC has its own budget which is not reviewed by any other branch. Its seven judges serve until the age of 65, and cannot be impeached for any reason whatsoever. Recent trouble signs emerged when the SCC's president (akin to the Chief Justice of the Supreme Court in the US) assumed the lead role in governing the parliamentary and presidential elections. Past members of the ruling elite were favored, and popular candidates were forced to vie for limited openings. Massive protests were waged, and the SCC relented somewhat. But most of their rulings stood, and many popular candidates were squeezed out or even disqualified outright. Most citizens regarded the final presidential election between Morsi and Shafiq as highly unsatisfying. Shafiq was a top member of the air force, and Morsi represented conservative Islamists from the Muslim Brotherhood. Completely missing from the final election was Egypt's highly popular secular voice. Indeed, Egypt's revolution was primarily driven by secularism, not a bias toward Islamic rule, and certainly not by a desire to return power to the old regime! In the end, Egypt's final presidential election ballot was a distortion created in large part by the SCC. Two days before the final election, the SCC realized their strategy would likely backfire, and the Muslim Brotherhood would win the election. To avoid complete disaster, the SCC shocked the world by dissolving the popularly elected Egyptian parliament––a parliament that was elected in a free election process managed by them! Further, they reallocated significant executive and legislative powers to the military, leaving the election all but irrelevant. The underlying, untold story from Egypt is this: The judicial system will use its legal power to support the wealthy few at any cost. The lesson for those citizens who want to reduce income disparity here in the US: don't underestimate the power and willingness of our Supreme Court to do the same thing! FDR launched the New Deal back in 1933 in response to the widespread income disparity that ultimately created the Great Depression. His New Deal was working, which meant that income disparity was declining. In a desperate effort to protect the interests of the wealthy few, our Supreme Court declared the New Deal unconstitutional. In retaliation, FDR held a famous fireside chat and presented his "court-packing" plan. All of a sudden the Court's viability was at stake. The Court immediately relented, and approved the New Deal in what was called "the switch in time that saved nine." Or, take the Court's recent Citizens United or Wall-Mart decisions. See the pattern? These, and many similar Court rulings intentionally help the wealthy few extract a grossly disproportionate share of wealth from our economy at the expense of everyone else. The most recent and significant protest in the US against economic inequality, the Occupy movement, was shut down by the courts. Even though mayors issued the actual orders to close the camps and obstruct constitutional rights to peaceful assembly, they correctly assumed the courts would support them. Judges are political beings, just like anyone else. They are biased members of the political process. The notion that judges can remain objective and impartial has been proven wrong, again and again. Until we make the judicial branch, like every other branch, accountable to the people, the courts will continue to support the wealthy few and undermine any efforts to establish a truly healthy economy. For a comprehensive set of recommendations on how to make the judicial branch accountable, read Deep Economics, Part 5. How Did Corporations Get So Powerful? Once upon a time there was a king. He wanted to get richer. He used charters to divide his lands into provinces run by lords. The charters allowed the king to retain ownership of his lands, and require the lords make regular payments to the king and protect the king's land. They also granted lords broad administrative rights over their provinces and the inhabitants, allowed them to keep excess provincial profits after paying the king, and protected them with the king's court and army. The charters worked quite well for the king and his lords; they became wealthier. Other kings followed suit, and they became richer, too. But suffering increased for serfs. Before charters, they only had to make kings rich. Now they were forced to make kings and lords rich. Serfs complained. They sought help from the courts, but found no justice. The first order of business for “equity courts” was to protect kings’ charters. Common citizen’s concerns were secondary. After centuries of oppression, people revolted and created democratic governments. Kings’ charters were nullified. In the US, authority over charters was given to each state. Initially, the states took charters seriously. They specified what corporations were allowed to do, and required corporations to serve the general welfare. But the states did not create new equity codes to enforce their people-centered charters. Instead, they deferred to British equity code, which was heavily biased in favor of the wealthy few. Consequently, state efforts to regulate corporations were consistently undermined by the courts. Eventually the states gave up. They allowed corporations to create charters that emphasized shareholders and ignored the interests of common citizens. After more than a century of growth in corporate power, the US was crippled by the Great Depression. A massive effort to reduce corporate power was launched by FDR. Scores of liberal laws were written. More importantly, they were enforced by FDR’s eight Supreme Court appointees. An era of widespread prosperity was launched, and it lasted for thirty years. But FDR’s Court appointees were gradually replaced by conservatives. Eisenhower had two appointments, and Nixon added four more. The balance of power on the Court radically shifted in favor of corporations. Since Nixon, the Court has consistently ruled in favor of corporations, culminating in recent decisions such as Citizens United and WalMart. History teaches us that the road to serfdom is ultimately paved in conservative legal code; code that places the interests of the wealthy few above the interests of the general welfare. There have been scores of people’s revolutions. They have nullified corporate charters, passed sweeping laws governing corporations, and appointed liberal judges. But such measures were never enough. The essential ingredient is a liberal equity code that consistently places the interests of the many over the interests of the few. Only then can we reverse centuries of legal precedent favoring the wealthy few, and hope to enjoy centuries of prosperity for we the people. Women: Want a Board Seat? 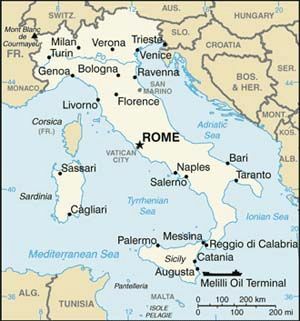 Move to Italy! Will this government regulation ruin Italy's economy? Will Italian corporations move to other countries that let them keep their old-boy networks intact? Whenever someone proposes regulating boards of directors in the US, a chorus of Chicken Little warnings are sounded along the lines of the above questions. But European countries have been regulating corporate boards for a long time, and their skies never fell. In the US, only 16% of board seats are held by women. What justifies this? Women just don't have what it takes? They aren't interested in these types of positions? If the US is ever going to bring corporations in line with our values, then we'll have to start regulating them. It's been amply proven that our highest values don't match theirs. They're Playing Chicken –– With Our Money! J.P. Morgan just lost $39 billion. The Senate Banking Committee wants to know why. Jamie Dimon, Wall Street's darling CEO, presented his defense: plausible deniability. He was advised by his staff to not unwind risky positions, even though they started to show big losses. Can any financial sector executive claim they fully understand the risks of their complex investments? We all know the answer is no. It's been proven over and over again. Think about what this means. Bank CEOs who do not eliminate these mysterious, huge risks are not acting responsibly. They have no ethical claim to plausible deniability. Remember Ronald Reagan and the Iran Contra affair? That was plausible deniability in action. Today's big-time CEOs use it all the time. 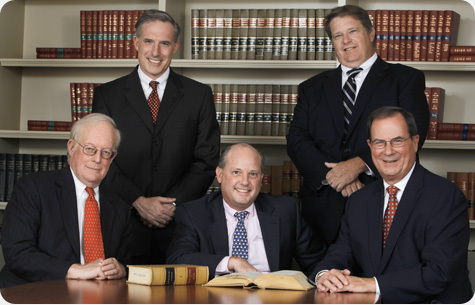 Our government, especially the judicial branch, has essentially handed out stacks of "Get Out of Jail Free" cards to these executives. It has to stop. The financial sector is trapped in a game of chicken. Huge CEO egos are involved. They have built fancy, souped-up cars with other people's money. And they are driving by remote control: if the cars crash, they don't get hurt. So nobody backs down. All four large banks must simultaneously retreat to pre-Gramm-Leach-Bliley risk levels. Since the banks won't self-regulate, we need to re-post the speed limits. Gramm-Leach-Bliley eliminated speed limits, and all but a few of us lost. How long are we going to let this game of chicken last? You think public elections are distorted by the Supreme Court's Citizens United decision? Well, corporate law is worse. It's so loosey-goosey that boards of directors can ignore "no" votes. That's right. Corporate law allows plurality voting, which means top vote-getters win regardless of how many people vote against them. For example, just last month shareholders voted 2-to-1 against a Sirius XM director candidate, but plurality rules let him win anyway. Making matters worse, corporate law does not give shareholders the right to nominate candidates, or call for votes on critical issues. But, it explicitly gives this right to boards of directors. So most of the time, shareholders only vote on candidates listed by the board, or on proposals presented by the board. Lacking legal pressure to do otherwise, board members usually nominate their buddies, and they almost always make proposals they strongly favor. Candidates who might shake things up on the board rarely see the light of day, and the same goes for proposals that might cut CEO pay, increase rank-and-file wages, or help restore the environment. The real secret to Delaware's success has been favoring directors over shareholders. Why? Because directors make the decision about where to incorporate. If Delaware does not keep them happy, they just leave for a more director-friendly state. Delaware relies on corporate revenue more than any other state, so director satisfaction is more important in Delaware than any other state. Since corporate law tilts in favor of executives, is it any wonder their pay is so high? Since corporate law ignores employees, is it any surprise that executives send jobs overseas, or pay non-viable wages? Since corporate law ignores the environment, is it any surprise that corporations do so much environmental damage? The solution starts with federalizing corporate law. Now conservatives would have you believe this is tantamount to declaring war on freedom and America itself. But in truth, the only risk is that executive pay might decline, and boards might become more accountable to the people. Sounds like a risk worth taking to me. I just watched a Niall Ferguson presentation on the "The Six Killer Apps of Prosperity" (TEDTalks, on Netflix). These factors explain "The Great Divergence," or how the West came to dominate the East in terms of wealth, and how the East has now erased the West's advantage by adopting the killer apps themselves. For context, it is useful to know that Ferguson endorsed Romney for President a year ago. His rationale: we need "a private-equity guy in the White House." 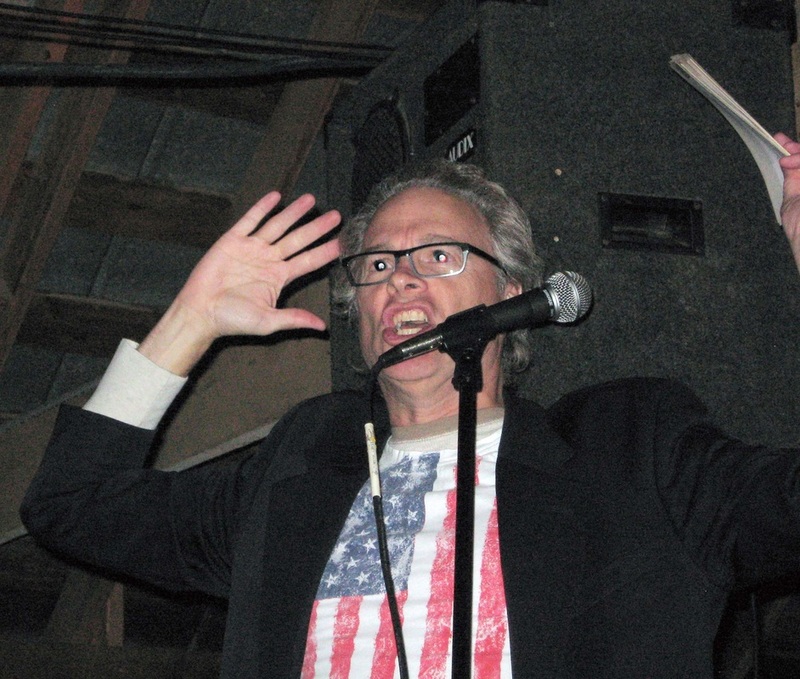 Simultaneously, he dismissed the Occupy movement as "Occupopulists." If nothing else, this conservative has a dry wit. Back to his thesis. Ferguson, and a vast number of conservatives like him, assume it is OK to sum the wealth of everyone living in a country, divide it by the total number of people in the country, and use the resulting average to compare nations, continents, or civilizations with one another. To make things exciting, conservatives then compete with one another to invent stories, called "theories," for why average wealth went up or down over time. For all his brilliance, Ferguson's work is flawed by an egregious statistical error: you can't use averages to describe skewed numbers! This tenet is taught in every introductory statistics class; it is a very basic principle. Averages would allow Ferguson to proudly proclaim that average wealth has been rising in the US, when, in fact, wealth has been declining for most people. Since wealth has increased dramatically at the top, the average is inflated, and the important story impacting the greatest number of people is concealed. Numbers can reveal the truth, or they can disguise it. It depends on your values. If you value compassion and the general welfare, then you studiously avoid averages in economics. But if you value greed or winning at any cost, then averages are a great tool for hiding the carnage. Ferguson's failure to abide by the fundamental rules of statistics means his work is fundamentally flawed. It also means that every economist who uses averages is very likely making the same mistake. And, since there are lots of economists using averages, then ... well, I think I've made my point. The leading killer app in economics is averages. Women need a 65% pay increase to reach men. 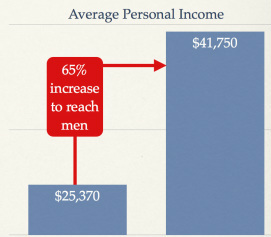 In 2009, average personal income was $25,370 for women and $41,750 for men. $25,370 is a very low income. It's barely over the poverty line for a family of four. It would cost $2 trillion per year to fix this problem. That's a lot of money. For example, we spent $4.8 trillion in four years on the financial sector bailout. The simplest explanation for why women are paid less than men is that it would cost a lot of money to pay them the same. In classic economic terms, where markets are all-wise, the huge pay disparity between men and women can only mean one thing: women are worth far less than men. And, since the markets are never wrong, there must be a good, logical explanation for why women are worth less. Such as: women prefer lower paying jobs, or women don't perform as well as men. But, if we make the far more rational assumption that women are just as capable as men and they want to earn as much as men, then we must conclude that the markets are not wise, and something else is going on. Indeed, all the evidence tells us the markets are anything but perfect, and that the cause of male/female pay disparity has nothing to do with capabilities or preferences, and everything to do with our values. Take the Supreme Court's recent Wal-Mart decision. The following facts were uncontested: women fill 70% of the lower-paying hourly jobs, but only 33% of the higher-paying management jobs. If the Court valued fair pay, it would have ruled that Wal-Mart was obviously discriminating against women. But ever since Eisenhower's two and Nixon's four conservative appointments, the Supreme Court took a decisive turn in favor of corporate interests, and has rarely looked back. We must ask ourselves: Do institutions like the Supreme Court and corporations value the same things we do? Certainly this can't be true. Otherwise, what kind of society are we –– one that values women less than men? And, if these institutions are not in alignment with our values, what are we going to do about it? One month ago Amendment 1 passed, making North Carolina the last Southern state to constitutionally ban gay marriage. Where is the payoff from bashing gay rights? Perhaps history has a clue. The South's last unanimous campaign against civil rights targeted the black race. Even though most Southern whites had nothing to gain economically, they fought and died to protect slavery. Why? Taney's words succinctly captured Southern hatred of blacks. Southern gentry used it to their advantage: you poor white boys better fight and fight well, otherwise the North will force you to live cheek-to-cheek with those blacks. It was a powerful battle cry. Confederates were three times more effective than Yankees at killing the enemy. Fighting against feared personal degradation was far more motivating than fighting for somebody else's freedom. And now Southern hatred rises again, but this time against gays. 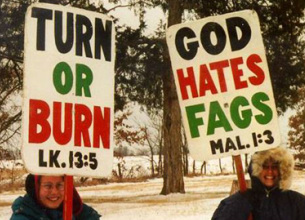 Posters like "God Hates Fags" present the essence of the message sent by Christian fundamentalists across the South. And it worked: 61% of voters supported Amendment 1 in North Carolina, which in politics is a tremendous margin of success. Liberals, fighting for somebody else's rights, were far less effective and took a terrible beating at the polls. Conservative wealth needs voter support to maintain dominion. It wins that support by aligning with hate campaigns. War is a longstanding favorite. Hate is rallied to rationalize war, which in turn feeds the mammoth arms industry. Another hate campaign is being tested today in Wisconsin. The campaign is presented by conservative wealth as a cure for our financial woes. But it's just another hate campaign, this time against public workers and their right to a decent wage, pension, and to be unionized. Conservative wealth hopes to win voter support, and thereby protect its dominion. Hate campaigns restrict our vision, especially when polished by massive infusions of money. Well-financed hate campaigns make it hard to see what is really going on. They delude us into thinking hate brings deliverance. But God will not smile on Southern churches for bashing gay rights. Wisconsin's economy will not heal by cutting public spending and restricting unions. Yet hate campaigns supported by egregious wealth consistently make silk purses out of sow’s ears. In previous posts I described my disappointment with President Obama's shift from a liberal campaign to a moderate presidency. In this post I discuss another moderate: Robert Reich. In 2000 he published The Future of Success. In it he claimed: "Most of us are more prosperous than ever before. We own more. We're able to get terrific deals." And: "Today we can see the emergence of a vibrant new economy brimming with innovations. ... Jobs will be abundant, many of them exciting and well paid." Reich was wrong. He was the Secretary of Labor for President Clinton from 1993 to 1997. He had a unique opportunity to help the common worker. But he missed it. Vast segments of our population were experiencing employment and income decline. He should have fought for the middle class when he had the chance. Instead he predicted utopia. Oops! In 2007 he published Supercapitalism. His thesis is summarized here: "The real explanation [for the widespread decline of economic prosperity] involves the way technologies have empowered consumers and investors to get better and better deals–and how these deals, in turn, have sucked relative equality and stability, and well as other social values, out of the system." "But the super-rich are not at fault. The market is generating these outlandish [high compensation] results. And the market is being driven by us as consumers and investors." "Boards are willing to pay more and more for CEOs and other top executives because their rivals are paying more and more for them. And all are willing to pay more because, in effect, consumers and investors are pressuring them to." This is typical "moderate-talk." It's like doublespeak. First he liberally denounces income disparity, then conservatively blames technology, not board directors or policymakers, and certainly not economists. Reich published Aftershock in 2010. Here he defends his 2007 thesis that technology was the culprit, but now adds globalization: "The underlying problem emerged around 1980, when the American middle class started being hit by the double whammy of global competition and labor-replacing technologies." But in 2007 he dismissed globalization as a cause of our woes, and offers no explanation for the change of tune. And he doesn't explain how he missed the demise of the middle class as Labor Secretary, or why he predicted utopia in 2000. Reich further revises his story: "Instead of implementing a new set of policies that would enable the middle class to flourish under these very different circumstances, political leaders ... embraced deregulation and privatization, attacked and diminished labor unions, cut taxes on the wealthy, and shredded social safety nets." On the one hand, Reich clearly makes a liberal statement here. But on the other hand, in 2007 he thoroughly discredited these types of liberal policies as "mostly nonsense." 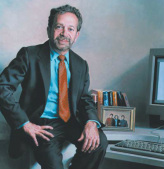 Will the real Robert Reich please stand up? My conclusion is that you can't trust a moderate. They say liberal things one day, and conservative things the next. I should be happy that Reich has now embraced the need for liberal policies that directly benefit the middle class. But I can't help but wonder what side of the fence he will be on tomorrow.